Segregation in Birmingham wasn't just a way of life. It was the law. The city's Racial Segregation Ordinances, adopted in 1951, demanded almost total separation of blacks and whites. Even after other Southern cities desegrated, Birmingham resolutely refused to do so. When segregation finally came to an end in Birmingham, it was due to the courage and strength of thousands of children and teens who would not give up despite a faltering plan to fill city jails and, therefore, impede the enforcement of segregation laws. Dwindling numbers of adults marched and were arrested in April. But in early May, thousands of young people protested, marched, and went to jail, bringing the nation's attention to Birmingham. We've Got a Job is moving and inspiring, with compelling firsthand accounts of the Birmingham Children's March from several of the participants. Interviews with four people who participated in the march and went to jail form the core of the book. Not only does it give readers personal insights and a strong sense of immediacy into what the time period was like, it's a great way of organizing information, especially since the four youths Levinson focuses on—Audrey Faye Hendricks (who was 9 years old at the time! ), Washington Booker III (14 years old), James W. Stewart (16 years old), and Arnetta Streeter (15 years old)—came from a couple of different neighborhoods, economic backgrounds, and varying levels of family involvement in the Civil Rights movement. It allows Levinson to explain background issues in a natural way, building off of the relationships and experiences of Audrey, Wash, James, and Arnetta. Levinson also covers dissent among black leaders, who disagreed over strategies and methods to use in their push for desegragation, and briefly touches on the beliefs of several white teens living in Birmingham at the time. The design of We've Got a Job is simple but effective. Chapters are broken into clearly delineated sections, and the majority of sidebars are placed in such a way that does not interrupt the flow of the text. The black and white photos, interspersed throughout the book, are not as arresting (no pun intended) as those in Elizabeth Partridge's Marching for Freedom: Walk Together, Children, and Don't You Grow Weary but many are still striking and effectively convey the atmosphere and passion of the time. Back matter includes a brief author's note, source notes and bibliography, and an index. The notes are adequate, but I have to admit that I would have liked more details about how Levinson conducted her research and found her four informants (a la Marc Aronson—I mean, have you seen the notes in Master of Deceit: J. Edgar Hoover and America in the Age of Lies, which are comprehensive and just as fascinating as the main text itself? Chapter 10 of We've Got a Job briefly discusses how many Civil Rights leaders were suspected of being Communists, a subject Aronson covers in more detail in Master of Deceit). 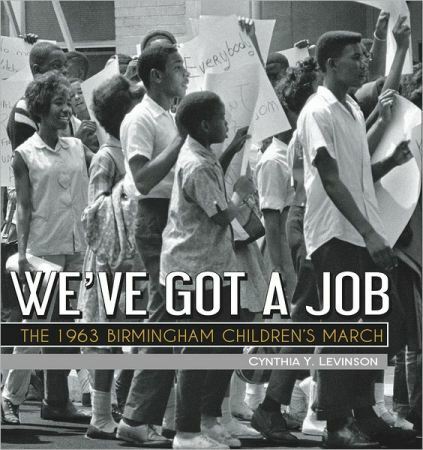 We've Got a Job is one of several excellent books for older kids and teens about the Civil Rights movement published in recent years. If We've Got a Job piques your interest in the subject, you should definitely take a look at the aforementioned Marching for Freedom by Partridge, as well as Philip Hoose's Claudette Colvin: Twice Toward Justice. Book details: upper MG/YA nonfiction, published 2012 by Peachtree, ISBN 9781561456277.